Original Source: "EC 1382 Fashion terms and styles for women's garments"
1920's fashion from one of Kodak's earliest color film experiments. 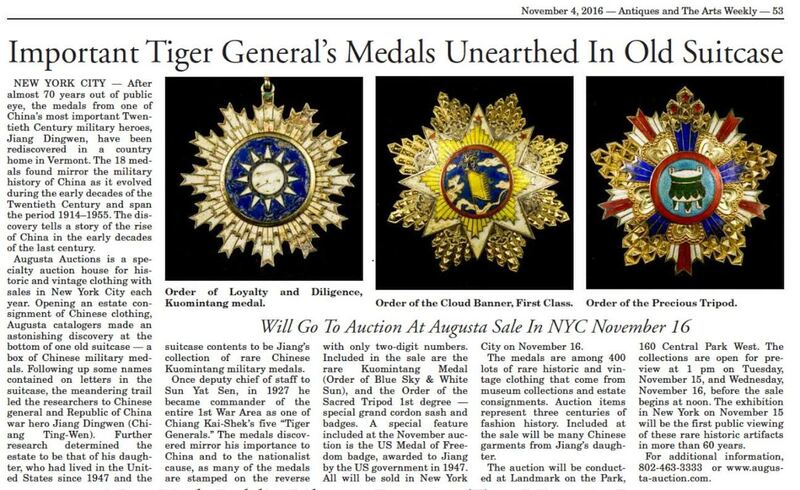 November 4, 2016 - Antiques and The Arts Weekly - After almost seventy years out of public eye, the medals from one of China’s most important 20th C. military heros, Jiang Dingwen (蔣鼎文), have been rediscovered in a country home in Vermont. The eighteen medals found mirror the military history of China as it evolved during the early decades of the 20th century and span the periods from 1923-1965. The discovery tells a story of the rise of China in the early decades of the last century. Our dear friend, Doris Raymond, was just featured in a great article on vintage fashion at the Forbes website. It appears that the business world is joining the fashion world in their appreciation of Vintage fashion.